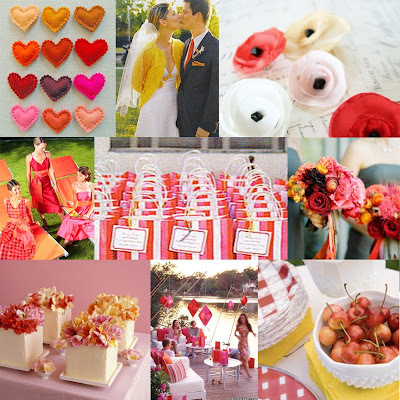 This is probably not what you would typically think of for a Valentine's day inspiration board but the image from Purl Bee at the top left is certainly inspirational in its own right. I love the warmth of this palette and adore the fact that its not just red or just pink. The wonderful combination of colors adds such a fun flare to this palette. Oh how I LOVE this! It's so energetic and sweetly romantic, not a bit cheesy like some valentine's day stuff can be. great color combos!